(Reuters) – Billionaire Tom Steyer has rapidly become one of America's most visible environmental advocates, vowing to punish lawmakers who don't oppose climate change and pledging to spend up to $100 million to put the issue center stage in the Nov. 4 elections. His in-your-face tactics have made him fierce enemies on the right who accuse him of hypocrisy and claim that he made much of his fortune through investments in fossil fuel energy at Farallon Capital Management, the San Francisco-based hedge fund he founded in 1986. Steyer, 56, stepped down as co-managing partner of Farallon in 2012 to devote himself to full-time activism because, as he later wrote, he "no longer felt comfortable being at a firm that was invested in every single sector of the global economy, including tar sands and oil." But he has provided few details of the extent of those fossil fuel investments or how he profited from them. He said in July 2013 that when he had left Farallon, which manages much of his estimated $1.6 billion wealth, he had instructed the fund to divest his holdings in fossil fuels. Neither he nor Farallon has said whether that process has been completed. Farallon declined to comment. A spokesman for Steyer declined to comment for this article. Until now, most of the conservative ire against Steyer has focused on Farallon's energy investment record in the United States. Little attention has been paid to foreign investments such as its forays into Asian coal. During Steyer's tenure, Farallon helped finance coal project acquisitions in Indonesia andAustralia valued at more than $2 billion and covering some of the region's biggest mines, some of which swiftly ramped up production afterward, according to a close examination by Reuters of company disclosures and interviews with people involved in the deals. While Farallon has not made public its shares in these deals, sources familiar with the fund's dealings say they amounted to at least several hundred million dollars. The Asian coal investments were mostly conducted through Noonday – a unit of Farallon set up by Steyer's deputy, Andrew Spokes, in 2004. Spokes co-led Farallon from 2007 and succeeded Steyer after his departure. In Steyer's final note to investors in 2012, he said Spokes "embodies values in which I believe and which distinguish our firm." People familiar with Steyer's management of Farallon said that while his main focus was on the United States, he would have signed off on those foreign deals and, as co-managing partner, would have shared in their profits. "The discretion to make or break any investment rested with him," said a Farallon investor, who asked not to be named. The ramped-up production at the Indonesia mines contributed to Asia's coal boom as demand for fuel surged in China and India and prices soared, according to industry analysts. Farallon's investments in Indonesia and Australia included projects that raised concern among local environmental groups over air and water pollution and coal's role in global carbon emissions, which contribute to global warming. Under Steyer's stewardship, Farallon grew to become one of the world's largest hedge funds. Farallon's regulatory filings show energy currently makes up nearly 9 percent of its overall $19 billion portfolio. "He made us a lot of money and his attitude has always been ‘whatever it will take to make money,'" said one former investor with his fund, who asked not be named because of his ongoing relationship with Steyer. As Steyer has become a bigger voice in U.S. politics, the Republican party and other conservative groups have sharply escalated their attacks on the big Democratic donor, raising questions about how he made his money. 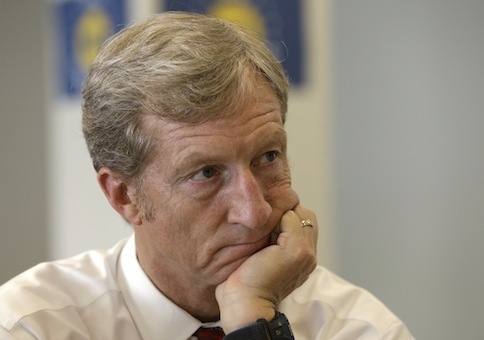 Conservative attacks on Steyer's record have mainly focused on his fund's involvement in U.S. energy companies like Kinder Morgan, which has plans to expand an oil sands pipeline to Canada's West Coast. Just before Steyer left Farallon in 2012, the fund held $125 million worth of Kinder Morgan securities, along with $220 million in shares of Nexen, a Canadian oil sands producer, according to U.S. filings. Farallon's investments contrast with Steyer's aggressive campaign against fossil fuels in North America, in which he has targeted politicians who support TransCanada's proposed Keystone XL pipeline from Canada to the United States and has urged universities to sell off their coal stocks, saying "a coal free portfolio is a good investment strategy." While little noticed, in Indonesia, Farallon helped finance the leveraged buyout of three coal companies, including the country's No. 2 coal miner Adaro Energy in 2005. Indonesia is the world's biggest coal exporter, according to the U.S. Department of Energy. Farallon's involvement in the Adaro deal laid the foundation for a 60 percent expansion in production at the firm that was lucrative for all involved, said Edwin Soeryadjaya, chairman of Saratoga Capital, which owns a major stake in Adaro. The Adaro buyout was valued at about $1 billion, according to Adaro's website. A source involved in the deal said Farallon's share included $110 million in loans, and a direct purchase for $5.5 million of an 11 percent stake in the company that later surged in value. "They were bullish on making money … If they didn't like it they wouldn't go with it, but for that they were rewarded very well," Soeryadjaya told Reuters. Farallon's Noonday unit approached Adaro when Asian coal prices were $50 a tonne. When Adaro went public in 2008, coal prices were $170 a tonne, yielding a solid return for investors. Adaro's coal output during that period soared 60 percent to 38.5 million tonnes. Farallon made other inroads into Indonesian coal too, including helping to finance an Indonesian-led consortium's purchase of Berau Coal, Indonesia's fifth largest producer, in 2004 and Indonesian mining company Bumi Resources' $500 million acquisition of Kaltim Prima Coal from BP and Rio Tinto in 2003. Production jumped at those mines, too. The amount of money that Farallon contributed in these deals remains unclear. David Price, senior coal analyst at consultants IHS, said the leveraged buyouts funded by Farallon were important for raising Indonesia's coal production, which quadrupled between 2002 and 2012 and triggered worries among environmentalists about pollution and carbon emissions. "There was an enormous amount of Chinese demand for imported coal. So there was incentive to increase production," Price said. "At the same time the leveraged buyouts were instrumental. Everyone knew at the time that the first thing the buyers would do was ramp up production in order to regain their capital expenditure as quickly as possible." A source familiar with Farallon disputed any link between the hedge fund's investments and the surge in coal production, saying the investments did not give the fund any say on the Indonesian companies' operations. "The biggest friend to rising production is prices, and Farallon can't take credit for that," the source said. The Adaro mining site in Tanjung, South Kalimantan, produces some of the world's cleanest coal – with low sulfur content and low ash, industry experts said. But there is still air pollution from coal dust and pollution of the Balangan River that Adaro uses to channel coal out on barges, said Arif Fiyanto, an activist at Greenpeace Indonesia, whose team monitors the area. Saratoga Capital's Soeryadjaya said Adaro worked hard to minimize impact on local communities. Farallon's investments in Australia, meanwhile, laid the groundwork for the fund to become the biggest shareholder of Whitehaven Coal, which is developing one of the country's biggest remaining coal reserves, Maules Creek. The mine has become a lightning rod for environmentalists worried it will deplete water supplies and destroy a forest, while producing coal that will add to carbon pollution. Farallon provided a loan of $335 million for entrepreneur Nathan Tinkler's acquisition of the mine in 2009, according to a source familiar with the deal. Tinkler's company, Aston Resources, went public in 2010 and then was taken over by miner Whitehaven Coal in 2012. Farallon loaned Tinkler more money to buy other mines, but when that loan came due in the midst of slumping world coal prices, cash-strapped Tinkler had to repay Farallon in the form of half of his stake in Whitehaven. Farallon became Whitehaven's top shareholder by the end of 2013, after Steyer's departure, according to public filings. Whitehaven's share price had nosedived more than 60 percent over the preceding two years. "Early investors made a lot of money. Farallon were part of that," said a person familiar with the Maules Creek loan. But he noted investments made later, including those by Farallon, were showing losses. "It's been a rollercoaster," the source said. The Maules Creek mine is due to start producing in 2015. Green groups, farmers, local Aboriginals and the community in the surrounding area worry it will destroy the Leard State Forest, hurt farms, spread coal dust on nearby towns, and damage sacred indigenous sites. Whitehaven says it went through a rigorous environmental approval process and all of the issues have been addressed. The Maules Creek mine won state and federal environmental approvals following a three-year process, which included a court challenge by environmentalists. "It (Maules Creek) has become the focus point for a lot of people who are concerned about inaction on climate change," said Georgina Woods, New South Wales coordinator for the Lock the Gate Alliance, a coalition of environmental groups. When Farallon won its initial stake in Whitehaven in 2012, Steyer, too, was worrying about climate change.